See full article here. It's a nice mix of All for the Boss, Reb Boruch Ber and Ribnitz. בלבוש פרייפעלד. This is what the Jewish Charedi world has to offer as far as reading material. I'm not complaining, just observing. I don't read Jewish blogs, newspapers, or periodicals, bever did, they are all gunk. "He paid the caterer for dessert, but instructed that it not be served, as a zecher l’Churban, to temper the celebration in memory of the Beis Hamikdash." !מחוץ תשכל חרב - "I'm not complaining, just observing." ¡Hola! hālō, what Hālō ? Death at our Door! "buried and defeated the kosel that you don't see still weeps for redemption "
I'm a little farmisht here, why are you posting, or why is Rabbi Yehoshua Kurland giving a Shaba's 'nachmi' speech, before Shaba's chzon? oh just one more why or Vey, why must this nice speech start with an התעוררת from a goy, and ends with a נחמה for the Zionim. oy vey mir. It is time to re-discover simchah in our marriages. THIS T'SHA B'AV ! "His genius lies in his ability to share deep and powerful messages in conjunction with humorous stories and jokes in the spirit of the classic Talmudic milsa d'bidichusa. Through his wit, we become open to his teachings. Through his wisdom, we become open to change and inspiration. It is time to re-discover simchah in our marriages. It is time to celebrate our lives together and the symphony of marriage. It is time to recognize that the happiness we felt under the chupah can last a lifetime and that indeed, it is always: A Time to Dance. Born and raised in Baltimore, Maryland, Rabbi Kurland has warmed the hearts of hundreds of students throughout his thirty-eight years as a lecturer of Talmud and Ethics and as a mentor at Sh’or Yoshuv Institute of Jewish Studies in Far Rockaway, New York. He is a long-time student of its founder, Rabbi Shlomo Freifeld, of blessed memory. Rabbi Kurland lives with his wife Leah and family in Far Rockaway, New York. He is a popular speaker and the author of a series of books entitled A Time to Laugh, a Time to Listen, vols. 1–3. Rabbi Hutner-Freyfeld-Kurkland The gift that keeps on giving. להסיר מכשול - OU tuna ! This whole "Mishpacha" rag is nothing more than "yellow journalism", or worse. H: "The funny thing is, the article is not even so much about that... 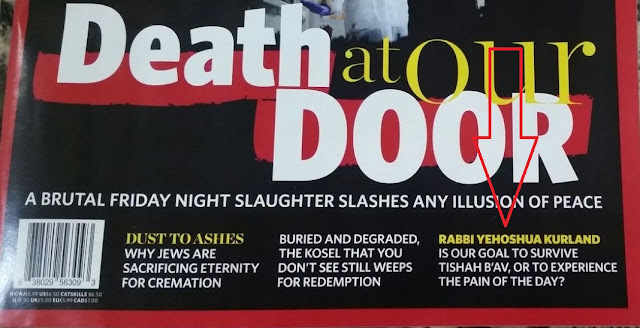 But I guess to grab your attention..."
ht: "This is what the Jewish Charedi world has to offer as far as reading material. " I haven't seen your complaints on rabbi rakeffet, when you post a picture of him in the Lubavitch'er "broadcast room" how come, are you biased? perhaps he found out that there was "glycerine" in the desert ingredients, which 99.9 % that it was their so it wasn't served, a true churban. perhaps he found out that there was "glycerine" in the desert ingredients, which 99.9 % that it was treif so it wasn't served, a true churban. This Rabbi is out of touch with reality, you can see hundreds of cheridim all over sitting on the floor saying 'kinus' with tears flowing from their eyes! the reason? because they read and comprend the "kinus"! not some translation or transliterations of it! they don't need speeches of rabbis to come up with some artificial "mourning" narratives on the curben. or to smell "onions" Areya Drei style to cry on the, חורבן בית המקדש . The litvaks are vacationing not 'learning' in the month of Av/Elul so they don't have discretionary time to the "funny things" posted here, maybe a post on "kosher OU adventures" will be more interested.